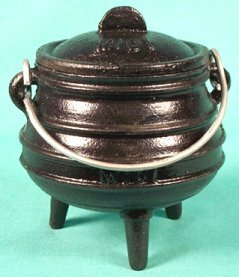 ICAUM: Cast Iron Cauldron Mini 2" diameter Pictured right. 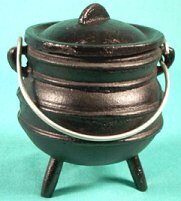 $18.00 Adorable potbelly style, baby 3-legged cauldron with carrying handle and lid. Made of heavy, cast iron in black. Makes an ideal charcoal incense burner or use it on the altar. Approx. 2" dia. ; 3¼" high with lid. ICAUD: Cast Iron Cauldron Midi 2 5/8" diameter Pictured left. $25.00 Little potbelly 3-legged cauldron with carrying handle & lid. Made of heavy, cast iron in black. Makes an excellent charcoal incense burner. Great size for the altar. Approx. 4" dia. at widest point; opening 2 5/8" dia. ; 4¼" high with lid. ICAU8: Cast Iron Cauldron 8" diameter Pictured right. 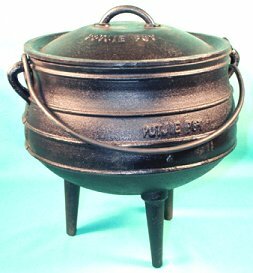 $60.00 Potbelly style, 3-legged cauldron with carrying handle & lid. Made of heavy, cast iron in black. Approx. 6" dia. ; 8" high with lid; gallon capacity. ICAU10: Cast Iron Cauldron 10" diameter Pictured left. 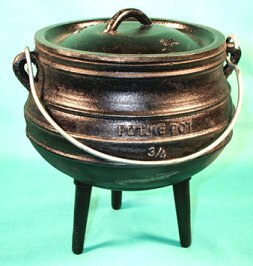 $120.00 Potbelly style, 3-legged cauldron with carrying handle & lid. Made of heavy, cast iron in black. Approx. 9" dia. ; 10" high with lid; 1 1/4 gallon capacity. Be sure to check our oil, herb, and incense pages, for components to use with your new cauldron. If would like a custom prepared spell, suited to your direct needs, consider a Spell Consultation with Morgana. Click here for details.